Relationship is a very sensitive topic. And there is a lot more to it. But trust me if you are in a relationship then for it to be happy, you need to ensure that there are various factors that are considered. Trust is one such factor. You got to trust each other while in a relationship. We are living in the 21st century and things now have changed a lot. In this technology frenzy era, we have failed to prioritize things that matter a lot to us. We fail to value our relations. A bond is special by various means, but it survives only when two people respect and value it. Never take people for granted especially those who love you and for whom your presence means something to them. Do not fabricate your feelings for them and use their heart as a toy. Last night my friend pinged me on WhatsApp and recited me the latest happenings in her relationship. I used to have a strong crush on her during the early stages of our friendship but later that dried up and I moved on. She informed me about this guy whom she liked and perhaps loved. She had dreams of togetherness with him, but sadly things veered out drastically when the discussion between them heated. Being a relationship analyst, I told her not to trust such men easily. But again, not all men are same. She used to address men as dogs before she got serious. But she trusted him a lot. Trust isn't a one-sided way. He recently moved to the US and sooner the long distance relationship didn't seem to click. Also, it was known that he was having an affair with another woman there. And my poor friend wasted her time thinking of him. I feel upset when I learned that she cried the entire night thinking of the incident. Love hurts for some! My point here is - Why show false hopes to someone when you don't mean anything? Why display fake feelings for someone when those feelings aren't real. Is it fun to break a woman's heart and use it as a toy to play with. 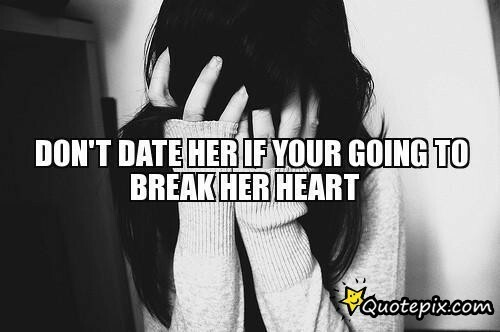 Never play with a girls heart. I got vexed when I learned about that yesterday that the guy was just playing and doing time pass with my friend. But in the end, whatever happens, happens for the good. I advised her to move on. It may sound easy to say but for someone who is reticent and kind and someone gave them the happiness of their life through small gestures and deeds, moving on becomes a difficult task. She loved him so much, but he loved her only as a friend. My heart grieved in sadness when she asked me - "What will he get by doing all this to me? You know he played with my feelings. I'm deeply hurt yar." I have always been saying that love is a sensitive issue. It works for many and for some it doesn't. Loyalty, Faithfulness, Commitment, Trust is something that defines a relationship. But these words seem trivial these days. But still I would say- Love is a waste of time! It is sad that at times you feel affected by certain events that affect your friends. This is life! But for our near and dear ones our heart beats more! Open your heart for someone who really cares for you and who promises not to take you and your emotions for granted. DO ensure you don't fall for a wrong person and hurt yourself! What's your views on this? How does one know that they have fallen for a wrong person? You can't truly know a person till you are with the person. Sometimes we realise things a bit late because we wouldn't wanna have any trust issues.. I've realized that to grow, we need our lessons too. Mistakes only make us stronger. Eventually we find the right person if we keep our eyes clear off emotions. The world is a beautiful mystery! I like your thoughts. But tell me one thing. Why is there an over-abundance of material where the guy is depicted as the dishonest goon and the girl as the innocent victim? :) Just a thought. Nice post though.